Stuttgart is home of Mercedes Benz and Porsche, some of the most influential carmakers, not only in Germany but also in the world. They were born here, shaped by the city, believe in the city, and committed to the city to make the most out of it. So what's so special about the city itself? Old city map of Stuttgart. Concentric Development on the west side of Necklar River. Okay, that sounds legit. It's one of the wealthiest cities in Germany with well established history and industry. It's a conducive environment for business entities. But it turns out that the whole future trajectory of the city was laid down by these gentlemen, Karl Benz, Gottlieb Daimler, and Wilhelm Maybach. The three gentlemen, each has their own automotive company, which are still withhold a prominent role in the automotive industry nowadays. Karl Benz's has becomes the legendary car brand Mercedes Benz which is known mostly for its luxury car apart from other vehicle such as busses and trucks, Maybach is currently focus on ultra-luxury sedan with Mercedes Benz, and at last Daimler, it's still in automotive industry but not directly manufacturing automobiles. Now known as Daimler AG, the group owns Mercedes Benz and Maybach. See how those are all comes together! Of course we are talking about the man, Ferdinand Porsche. Yes, he is the godfather of VW Beetle, the car for all the people. Porsche 64, one of the first initial Porsche car, was developed in 1939 referencing a lot from the Beetle. Porsche 356, developed in 1954 by Ferry Porsche, son of Ferdinand Porsche, featured air-cooled rear-engine configurations with sleek bodywork set the tone of the company's following line, the legendary 911. All Porsche's , design car is sleek, light, functional, and efficient. Now let's dive in into the real match between the love child of the two giants. At the left hand side, Porsche Museum with faceted tectonics elevated from the ground. At the right hand side, Mercedes Benz Museum with fluid mathematical curvature, nicely settled on the ground. A binary contrast between the two buildings, also if compared to each others products. Legendary key model that define the brand Porsche. G Wagen, a Mercedes Benz classic. Still being produced until now with almost unchanged exterior design. Porsche Design applies their approach on products.sleek, functional, and efficient. 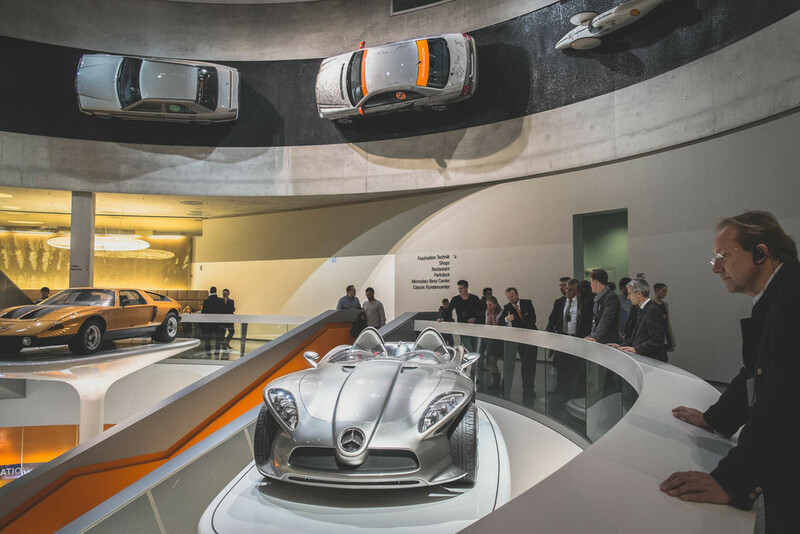 Design philosophy that becomes the foundation of both automotive brands really underlies the creation of the two museums. Porsche's design philosophy that deals with lightness and efficiency becomes the departure of its architecture. The elevated mass provides interconnected plateaus that conceives the world of Porsche apart from the ground. Reminder, this is not a Corbusian approach. Mercedes Benz on the opposing side approaches the design through programmatic organization strategy. Considering the amount of items the museum has, it might be the genius solution appropriate to its needs yet creates unique spatial quality out of it. The majestic void, the heart of the double helix. Oblique tunnel as visitor ascended to the elevated plateaus of Porsche world. Look up from the center of the void. Notice the circle in the middle as a device to create artificial indoor storm to evacuate smoke in the event of fire. That time capsule that brings you back to early time of the inception of Mercedes Benz. Sneak peek of what happens in the gallery plateaus. Custom fire extraction strategy allows the ceiling along the perimeter of the void free from fire separation line. Nice detail! 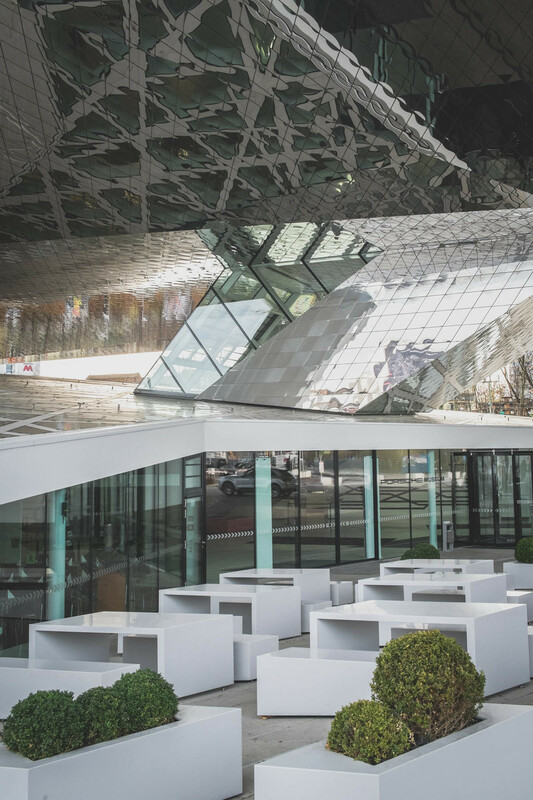 Porsche Museum apart from its bold architectural expression, is an engineering marvel in itself. 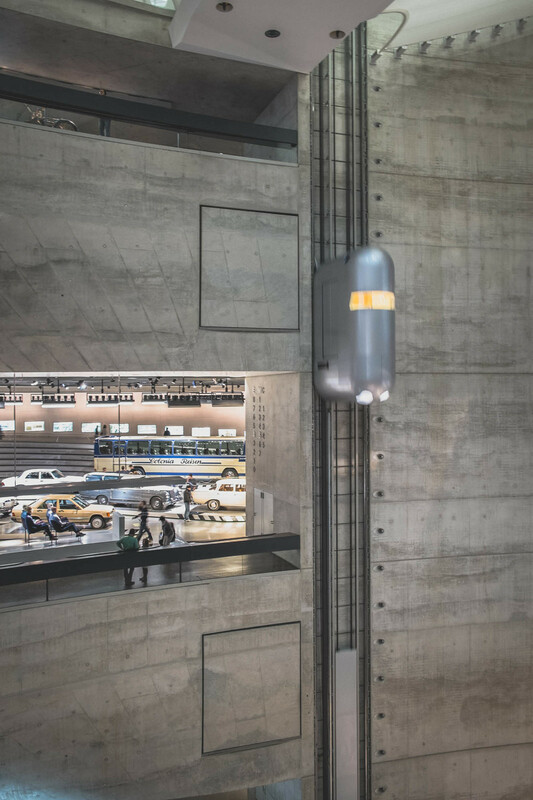 The spatial experience may not be as exciting as Mercedes Benz Museum, but it is what reflects Porsche's brand value. Mercedes Benz Museum at its time was very revolutionary in terms of the organizational system and how space generated in that regards. Furthermore, it creates a new kind of museum typology that is unique. To my personal opinion, it does left a certain impression when I visited the museum. It is spatially complex yet offer certain degree of explorative moments as part of the museum journey. Am I being subjective? Maybe.. I like Porsche a lot for the car, its boldness, and its structure. But this time my heart goes to Benz.